Act 81 (House Bill 783), sponsored by Representative Tedd Nesbit, amends Title 75 (Vehicles), in certificate of title and security interests, further providing for transfer of ownership of vehicles used for human habitation. Act 82 (House Bill 1386), sponsored by Representative Kristin Phillips Hill, amends the Public School Code, in certification of teachers, providing for instructional certificate grade spans and age levels and duties of the department. Act 83 (House Bill 1414), sponsored by Representative Stephen Barrar, amends Title 75 (Vehicles) of the Pennsylvania Consolidated Statute specifically permitting flashing or revolving lights in certain instances. Act 84 (House Bill 1499), sponsored by Representative Mark Keller, amends Title 68 (Real & Personal Property), in creation, alteration, termination, management of the condominiums, cooperatives & planned communities, for powers, for board members and officers; in protection of purchasers, for release of liens. Act 85 (House Bill 2297), sponsored by Representative John Taylor, Act designating several bridges and highways. Act 86 (Senate Bill 172), sponsored by Senator David Argall, amends Title 75 (Vehicles), in general provisions, for definitions; for speed timing devices and for automated speed enforcement systems in active work zones and establishing a pilot program for automated speed enforcement on highway. 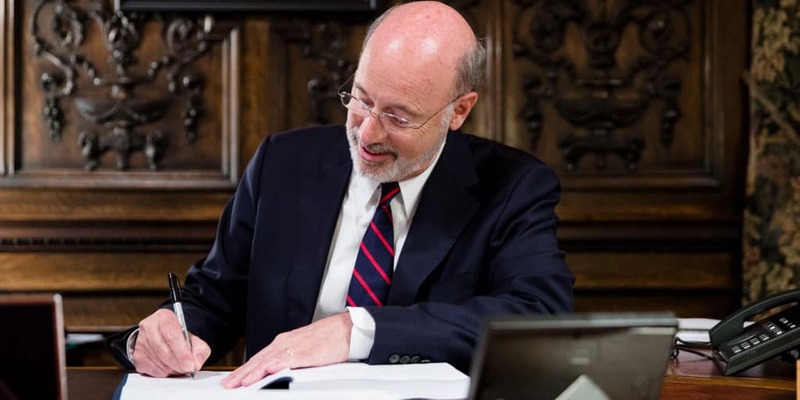 Governor Wolf also vetoed House Bill 2138.